Chef Nobu – Nobuyuki Matsuhisa – is the acclaimed and influential chef-owner of Nobu and Matsuhisa restaurants all over the world. 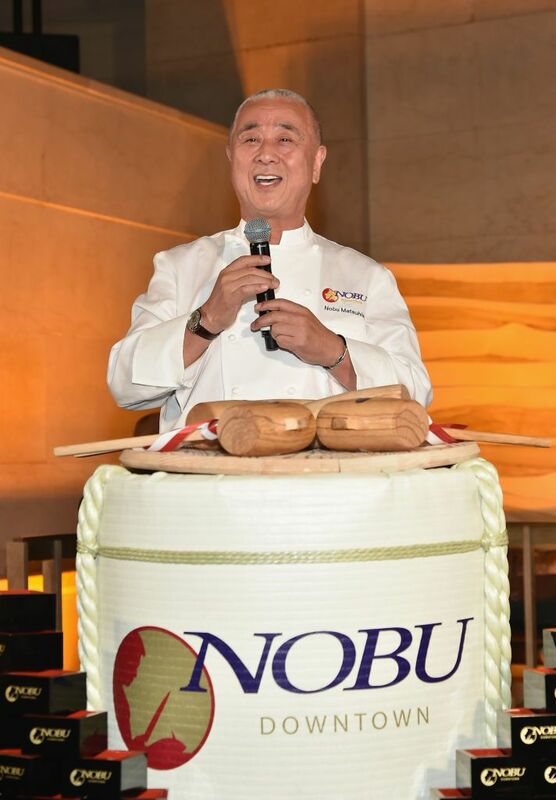 Nobu became the first celebrity chef to create and oversee a hotel brand, Nobu Hotels. The very first one, Nobu Hotel Caesars Palace, opened in Las Vegas in 2013. Like all the most famous chefs of their times – Apicious of ancient Rome, Escoffier of France, Alice Waters of Berkeley -- Chef Nobu transformed his home cuisine. He is responsible for the modern wave of Japanese fusion cuisine which updates classic sushi and other traditional dishes with global influences. Next time you bite into a piece of sushi topped with mango or jalapeño, or dig into an entrée of black cod with miso sauce, you have Chef Nobu to thank. Chef Nobu was raised in Saitama, Japan, near Tokyo. He knew what he wanted to do with his life the very first time he went to a sushi restaurant as a little boy. After high school, he got a live-in job at a sushiya in Tokyo. Following stints in Buenos Aires and Alaska, Chef Nobu took a friend's advice and resettled in Los Angeles. It was the late 1970s, and his timing was impeccable: L.A. was in the first flush of an enduring romance with sushi. In 1987, Chef Nobu marshalled his resources and opened Matsuhisa in Beverly Hills. Matsuhisa was an instant hit. L.A. dining critics went wild for Chef Nobu's cuisine. (Leading the charge was Luxury Travel's culinary scribe Max Jacobson, then a restaurant reviewer for the Los Angeles Times.) The legend was underway. And then the Nobu Empire expanded. Matsuhisa became an L.A. hotspot frequented by Hollywood celebrities. Robert De Niro, an artist's son and ground-breaking actor, resonated with Nobu's creativity. The two became good friends, and De Niro urged Nobu to open in his home neighborhood, New York City's Tribeca. Nobu New York opened in 1994 with two more partners: restaurateur Drew Nieporent and film producer Meir Teper. Their project became the talk of the town, and this Manhattan dining icon is today Chef Nobu's flagship eatery. There's more. Chef Nobu's hand is evident in his five Matsuhisa restaurants in the U.S. and Greece. One is set within the deluxe Solaris Residences in Vail, Colorado. Nobu Hotel Caesars Palace is a great success, drawing culinary-minded guests with an appetite for luxury and fine design. More Nobu Hotels are poised to roll out in London, Riyadh, and Bahrain, combining great dining, design, and service. Dining in Nobu Restaurants is a different kind of dining experience. These restaurants are not like other Japanese places, which tend to be subdued shrines to sushi. Each Nobu Restaurant is unique; there's no corporate sameness here. But all are glamorous and tastefully deluxe. Dining rooms are done with a soft Japanese palette and decorative elements that pay homage to time-honored Japanese culture. Yet the mood is vibrant and contemporary. Many Nobu Restaurants were designed by "starchitect" David Rockwell, who also created the serene look of Nobu Hotel Caesars Palace. According to Rockwell, dining at a Nobu Restaurant is more than a meal. It is a shared theatrical experience. Nobu restaurants offer extensive sushi, sashimi, and ceviche selections. But they also serve a variety of oven-cooked hot dishes such as a delectable poussin chicken. Grilled items are on offer too, such as skewered kushiyaki and yakitori. And of course, there's battered and fried tempura of all kinds. Nobu Restaurants have introduced a teppanyaki menu. This Japanese cooking style showcases dishes cooked on iron slabs right at the table. Nobu Caesars Palace, the first Nobu Restaurant to offer this specialty, has three teppanyaki tables. A team of chefs creates a multi-course teppanyaki tasting menu, making magic before your eyes.